The basic principle behind the issuance of shares with differential voting rights, commonly known as ‘DVRs’ in India and dual class shares or ‘DCS’ in the international context, is to enable the companies to raise capital without dilution of control and decision-making power in company. In promoter or founder-led companies where promoters or founders are instrumental in the success of the company, such structures enable them to retain decision-making powers and rights vis-a-vis other shareholders either through retaining shares with superior voting rights or issuance of shares with lower or fractional voting rights to public investors. The concept was first recognised under the Companies (Amendment) Act, 2000 followed by similar provisions adopted by the Companies Act, 2013. However, the current practical scenario depicts a different picture, as the provisions of SEBI (Listing Obligations and Disclosure Requirements) Regulations, 2015 do not permit DVRs with higher or superior voting rights. Subject to certain conditions, DVR shares with lower voting rights are permitted. Till date, only five listed companies have used this structure in India. Strict pre-condition and corporate governance norms, unavailability of investors due to lack of awareness are some grounds of company’s reluctance from adopting this idea. 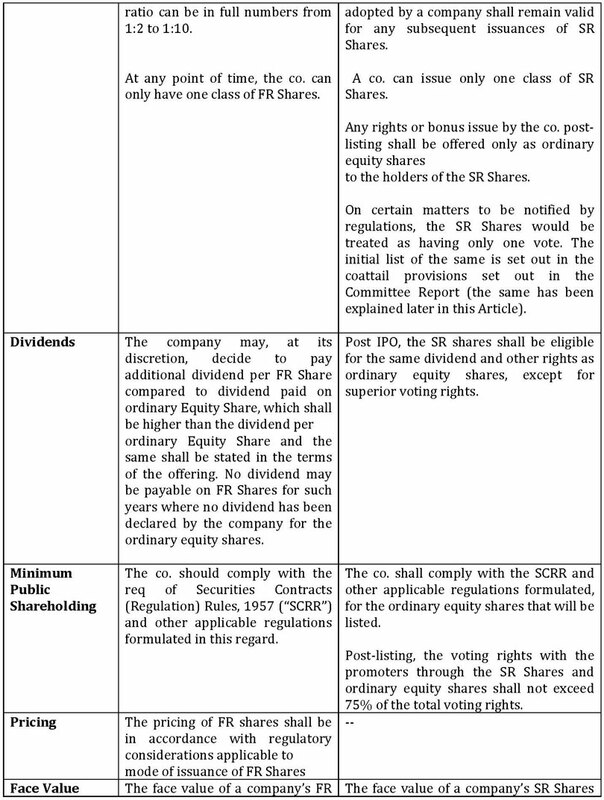 On 20 March 2019, SEBI came out with a consultation paper on issuance of shares with differential voting rights. 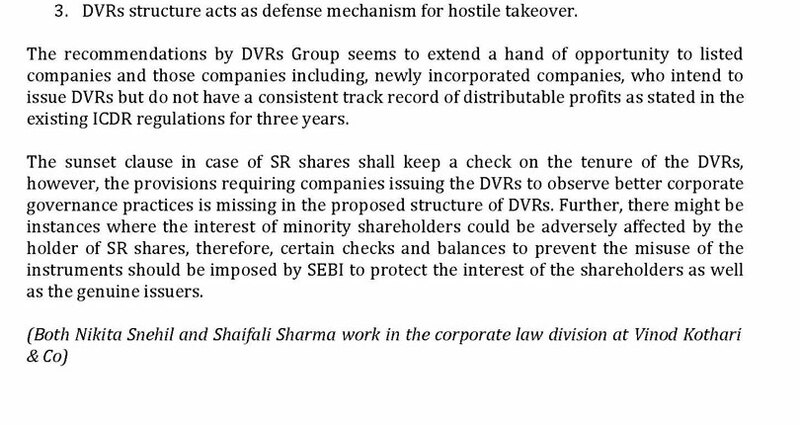 The paper provides that the matter of issuance of shares with DVRs was deliberated in the Primary Market Advisory Committee of SEBI (Committee) and a group (DVR Group) was constituted amongst the Committee members to do an in-depth study of the proposal of introduction of shares with DVRs in India. 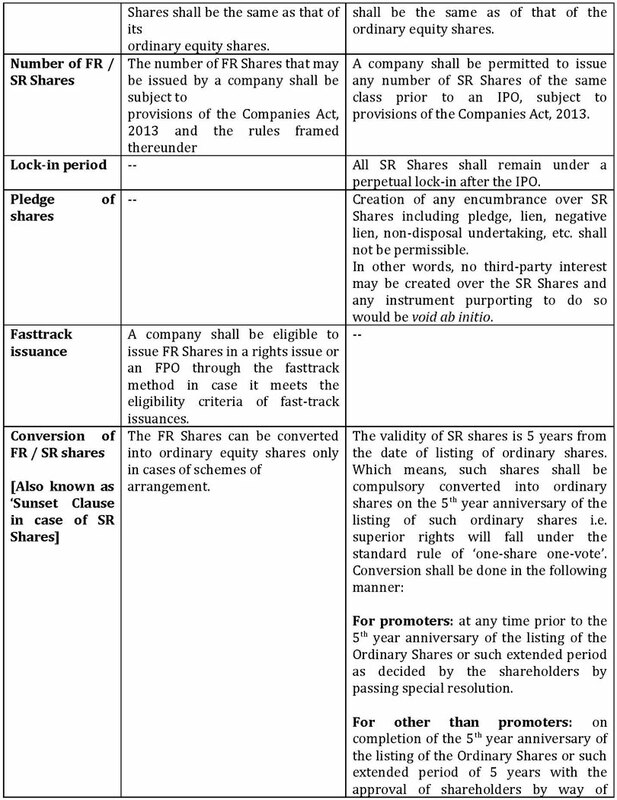 b) companies with equity shares not hitherto listed but proposed to be offered to the public. The basic objective behind allowing shares with differential voting rights is to raise equity without dilution of promoter control or to allow the promoters and founders to maintain control as they would hold shares with superior voting rights. 4) Private companies—exempted from applicability Section 43 of the Act, if either its memorandum or articles of association so provides—vide notification number GSR 464(E) dated 5th June 2015. In order to maintain the current growth phase in India, it is necessary for companies to raise capital to sustain this growth. Companies with high leverage or asset light models, may prefer equity over debt capital. Raising DVRs will reduce the dilution of founder and promoter stake, which may otherwise be the case. 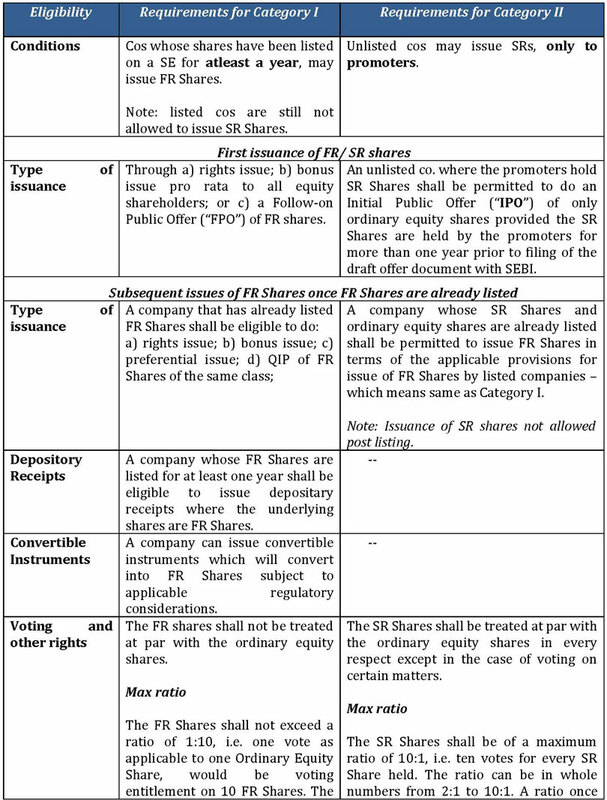 d) Issue of shares with lower or fractional voting rights (FR) to raise funds from private/ public investors. The global market has witnessed a mixed response to the concept of DVRs, while many countries have permitted the listing of companies with dual class shares or DCS (internationally used term for DVRs), some countries like UK, Australia, Spain, Germany and China do not permit the issuers with DCS structure for listing. 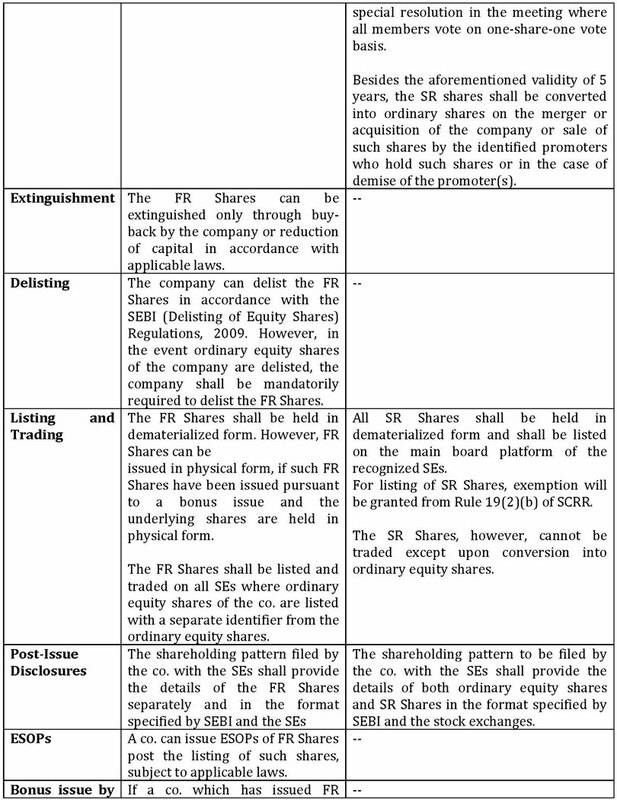 Category II: Companies whose equity shares are proposed to be listed—issuance of SR shares. h) any other provisions notified by SEBI in this regard from time to time. 3. DVRs structure acts as defense mechanism for hostile takeover. The recommendations by DVR group seems to extend a hand of opportunity to listed companies and those companies including, newly incorporated companies, who intend to issue DVRs but do not have a consistent track record of distributable profits as stated in the existing ICDR regulations for three years. Market regulator Securities and Exchange Board of India (SEBI) has clarified that investors can continue to hold shares in physical format after 1 April 2019. However, transfer can take place only for shares that are dematerilised, it added. 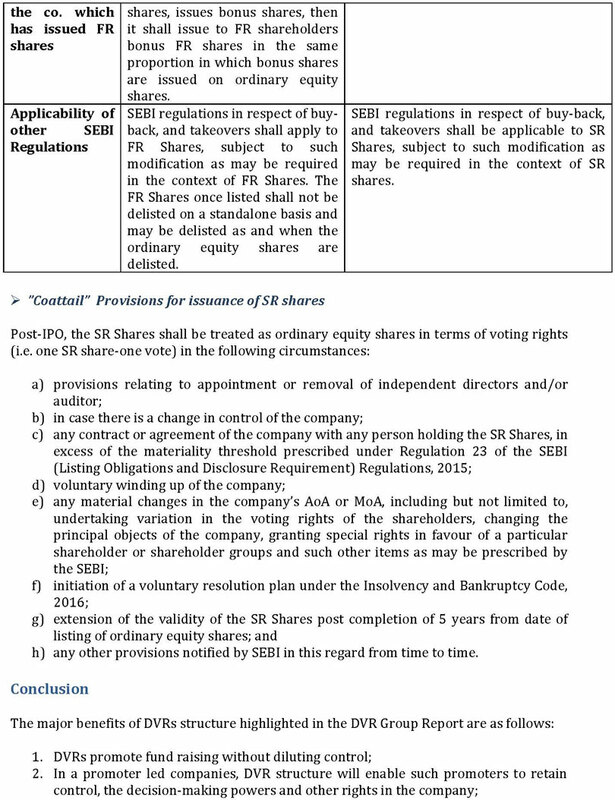 In a statement, SEBI says, "...investor has the option of holding shares in physical form even after 1 April 2019. Any investor who is desirous of transferring shares, which are held in physical form, after 1 April 2019 can do so only after the shares are dematerialised." "The transfer deeds once lodged prior to the 31st March deadline and returned due to deficiency in the document may be re-lodged for transfer even after the deadline of 1 April 2019," it added. This decision, according to SEBI, is not applicable to cases related with demat of shares, transmission or transfer of title of shares by way of inheritance or succession and transposition or re-arrangement or interchanging of the order of name of shareholders. Last year in March, the market regulator had announced that securities and shares held in physical form will become illiquid after 5 December 2018 and anyone intending to trade physical shares will be able to do it only via a dematerialised or demat mode with a depository. This deadline was extended till 31 March 2019 after several representations and requests were made to SEBI by scores of investors still holding scrips in physical form. The SEBI mandate to dematerialise physical shares does not apply in case of transmission or transposition of securities. However, if an investor needs to transfer or sell or trade shares, it has to be held in a dematerialised form with a depository. SEBI needs to extend the March 31 deadline. i agree as RTA cannot cope up the load as they are very rigid for small things .sebi asked them to do easily but they do not listen. The Union government has refused to share details under Right to Information (RTI) Act on appointment of Shaktikanta Das as governor of Reserve Bank of India (RBI), says a report. Replying to an RTI query, the government has declined to share the details, including names of short-listed candidates and file notings related to the appointment of Mr Das as RBI governor. The government has cited a clause in the RTI Act that bars disclosure of information, including records of deliberations of the council of ministers, secretaries and other officers, the report says. On 11 December 2018, Mr Das was appointed as RBI governor for three years replacing Dr Urjit Patel. Dr Patel had abruptly resigned from the post amid a face-off with the government over issues related to governance and autonomy of RBI. The RTI application was filed by a correspondent from PTI, seeking copy of any advertisement or vacancy circular issued by the government on appointment of RBI governor, names of all applicants who had applied for the post and those short-listed for the top post from the department of financial services (DFS). In its reply, the DFS said the selection of RBI governor is done by the appointments committee of the Cabinet on the basis of recommendation made by the financial sector regulatory appointments search committee (FSRASC). The committee is headed by cabinet secretary and has additional principal secretary to prime minister and secretary of the department concerned besides three outside experts as its members, the DFS said, without giving the names of the experts. The Section bars disclosure of "cabinet papers, including records of deliberations of the council of ministers, secretaries and other officers." Mr Das, a 1980-batch IAS officer of Tamil Nadu cadre, retired as economic affairs secretary in May 2017 and was since appointed India's Sherpa to the G-20 and a member of the Finance Commission.